Today we're excited to announce our first step in a bold new direction: active recall. 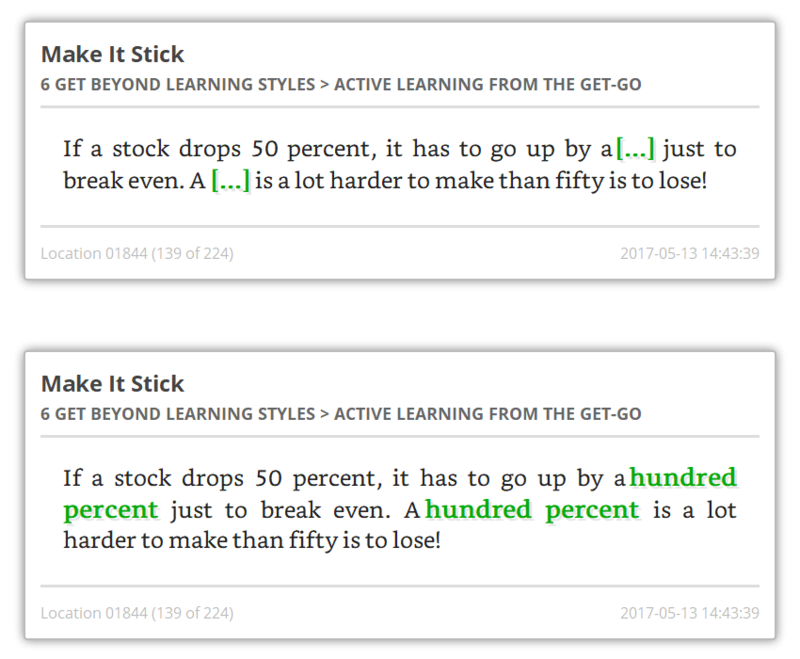 Readwise already uses spaced repetition to help you remember more of what you've read. Active recall will take your retention to the next level. Active recall testing (also known as quzzing, testing, or retrieval) is the process by which we challenge our minds to retrieve a piece of information rather than passively reviewing or re-reading the same information. In very short order we lose something like 70 percent of what we’ve just heard or read. After that, forgetting begins to slow, and the last 30 percent or so falls away more slowly, but the lesson is clear: a central challenge to improving the way we learn is finding a way to interrupt the process of forgetting. The passive approach to remembering this information would be to simply re-read that passage from time to time. This is no doubt better than never revisiting the passage, but research has repeatedly shown that active recall testing is significantly more effective. Question: According to Make It Stick, approximately how much of what we've just read or heard do we lose in very short order? The power of this technique is probably intuitive, but the scientific evidence backs it up. The key to learning more is forgetting less. The key to forgetting less is systematic review. And the best way to review is through active recall. How does Readwise harness active recall? The example above used a form of active recall often referred to as question & answer. While we intend to add question & answer flashcards to Readwise eventually, it's not a particularly practical introduction to active recall for the casual reader. In very short order we lose something like [...] of what we’ve just heard or read. After that, forgetting begins to slow, and the last 30 percent or so falls away more slowly, but the lesson is clear: a central challenge to improving the way we learn is finding a way to interrupt the process of forgetting. Cloze deletion is, of course, just a fancy way of saying fill in the blank. This might sound trivial, but the simple act forces you to consider the surrounding context and search your mind for an answer. This, in turn, is scientifically proven to form stronger memories enabling you to remember profoundly more of what you've read. ... researchers showed that simply asking a subject to fill in a word’s missing letters resulted in better memory of the word. Consider a list of word pairs. For a pair like foot-shoe, those who studied the pair intact had lower subsequent recall than those who studied the pair from a clue as obvious as foot-s__e. ... The modest effort required to generate the cued answer while studying the pairs strengthened memory of the target word tested later (shoe)." How do we know cloze deletion works with highlights? Aside from the experimental evidence in cognitive science, we know cloze deletion pairs nicely with your highlights because we've been experimenting on ourselves for years using a popular, open source flashcard application called Anki. The year was 2016 and I was in the midst of a yearlong sabbatical from my career in private equity. The time off afforded me an opportunity to devour one to two challenging books per week. I loved reading at this pace, but I began to notice that I could hardly remember the important bits of a book I'd read fewer than two or three months ago. Frustrated, I wondered: Why should I spend so much time reading if I'm barely going to remember any of what I've read? Serendipitously, I was feeling this frustration at the same time as I was climbing the notoriously steep learning curve of a powerful flashcard application called Anki. Like most users, I was drawn to Anki for foreign language learning, but I had a hunch the flashcard software could be used in other domains. Thus I had the crazy idea to scratch my own itch: What would happen if I downloaded my Kindle highlights, converted them into flashcards, and periodically reviewed in Anki? This was the accidental discovery of Readwise. It never even crossed my mind that such an idiosyncratic side project might have commercial appeal, but I found that periodically reviewing my highlights in Anki was so beneficial that my hobby organically evolved into the consumer product you see today — and we're just getting started! Our mission here at Readwise is to harness technology to improve nonfiction reading by an order of magnitude. There are many ways technology can make reading better, but the area we've focused on first is retention. First, it's well-known that we quickly forget most of what read (see above). Second, the best way to get more of something is often to lose less. We see this principle everywhere. In a subscription business, you're better off first reducing churn rather than increasing sign-ups. In personal finance, you're better off first spending less than earning more. In investing, you're better off first stopping losses before seeking gains. If we want to get more out of reading, it follows, we should not necessarily aspire to read more, but rather to lose less of what we've already read. This is Readwise. If you haven't already, sign up for Readwise today and start remembering significantly more of what you've read.